In my post yesterday, I showed you the gifts I made for each of my club members. 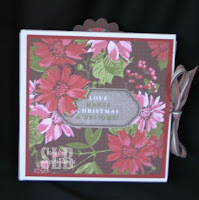 Today I'm going to show you a Christmas CD Envelope Album I made for the gift exchange we do. I made a small cookbook for my other club gift exchange which I neglected to photograph but I remembered to take pictures of this one. All products used were from Stampin' Up! except the CD Envelopes which were bought from Uline. For this project I used Holiday Treasures Designer Series Paper, elements from the I Wish Simply Scrappin' Kit, Mini envelopes 3x3, cardstock in Real Red, Old Olive, and Chocolate Chip, Alpine Ribbon originals, sticky strip and lots of dimensionals. To the left is the front of the album. It's hard to tell but some of the poinsettias have been cut out and fit around the albu m title. To the right is the first two pages there is also a page that slips into the left hand side. So, you basically have three pages to add photos to on these two pages. The right hand page pulls up out of the pocket. These two pages feature a page large enough for a full sized photo and two smaller photos. The right hand page has several poinsettias cut out and popped up using dimensionals. These next two pages are probably my favorite pages in the book. On the left side is a page big enough for a large photo. Then there is a cool, pop out piece that has three small envelopes attached. All three of these envelopes contain mini pages for small photographs or even some journaling of memories. The right hand page is large enough for a full sized photo and pulls out from the pocket. The two pages on the left have room for one large photo and two small photos or a photo and journaling. The last two pages have room for two larger photographs. The page on the right pulls out of the pocket. This last view is of the album opened up so you can see w hat the entire book looks like opened. I had a class on these in December and will have another class on these in January with a Valentine's theme. This is really beautiful, Sharon! What an awesome project!! Love all the pages & layers and different sizes of pages! Nicely done! !